Check Which Baby Bouncers, Seats or Chairs are Longest Here, for Longest Use. Choose the Longest Baby Bouncers or Baby Chairs, Because You'll Need the Space. Baby bouncers are not alike, though they make look like it. Choose a baby chair for length and safety, more than toys or other features. A difference of only an inch or two counts. The Eddie Bauer line appears to be the shortest. The baby chair brand that's typically longest, is Fisher Price. For a "long" baby bouncer your little one can safely grow in, The Fisher-Price Rainforest Bouncer is a favorite. 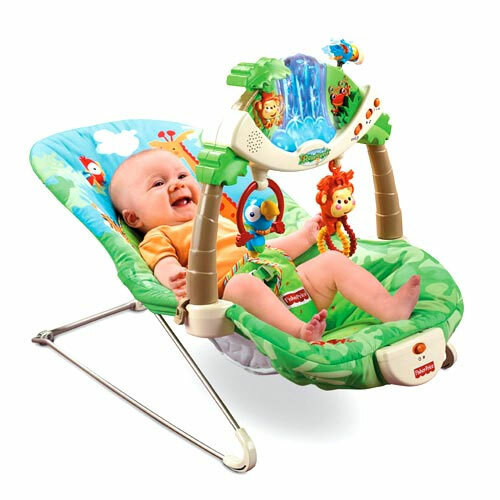 As mentioned, our pick of the popular standards is the Fisher Price Rainforest bouncer for best length. WARNING As if not bouncing weren't enough, the second drawback is the seat belt. A long baby really needs shoulder harness in this chair design, because the seatbelt sits low. 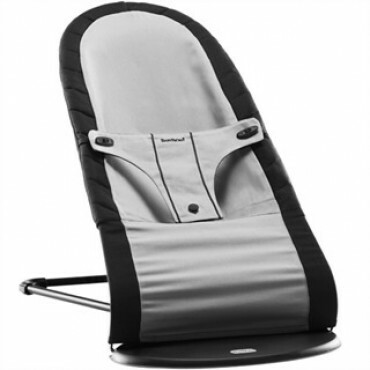 If not fully reclined, your baby can easily tip forward and hang him or herself at the waist! It happened to us. One trip the the bathroom, and we returned, baby was hanging upside down by his higher-than-average tummy. We returned it immediately. This is why, despite it's size, it's not a recommended pick. If you find it and are tempted because of the size, consider the lack of bounce, and the tip danger in a tall infant. Fisher Price Li'l Laugh N' Learn Bouncer. 19" - 12" (total 31") Weight: up to 25 lbs. Similar in size to the Rainforest bouncer, just slightly shorter. This chair is practically a bassinet, though it rocks instead of bounces. It's size and flexibility give it a longer life span for a tall baby than a normal seat. 26" fold to top, 18" bottom. Weight: up to 40 pounds when converted for toddlers. 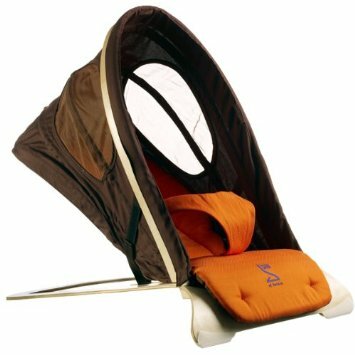 Fisher Price Lemon Papasan Infant Seat. (An exception to the Fisher Price is bigger rule. This one's small and flat.) 16" - 11" (total 26") Weight: up to 25 lbs. This is a relatively SMALL seat. Kids II Inc. Cradle In Comfort, Pink Boppy Bouncer. 16" - 13" (total 29") Weight: up to 25 lbs. Not tall behind head/back section. Sassy Zanzabar Bouncer. 16" - 11" (total 27") Weight up to 25 lbs. Not tall behind head/back. Eddie Bauer Soothing Comfort Bouncenette. 12" - 12" (total /24") The smallest we found.